Authentic, incredible, breathtaking, unique, amazing, unspoiled.. so many words are used to describe Georgia’s remote region which doesnt have any public transport connection to Tbilisi, but has world’s one of the most beautiful road. 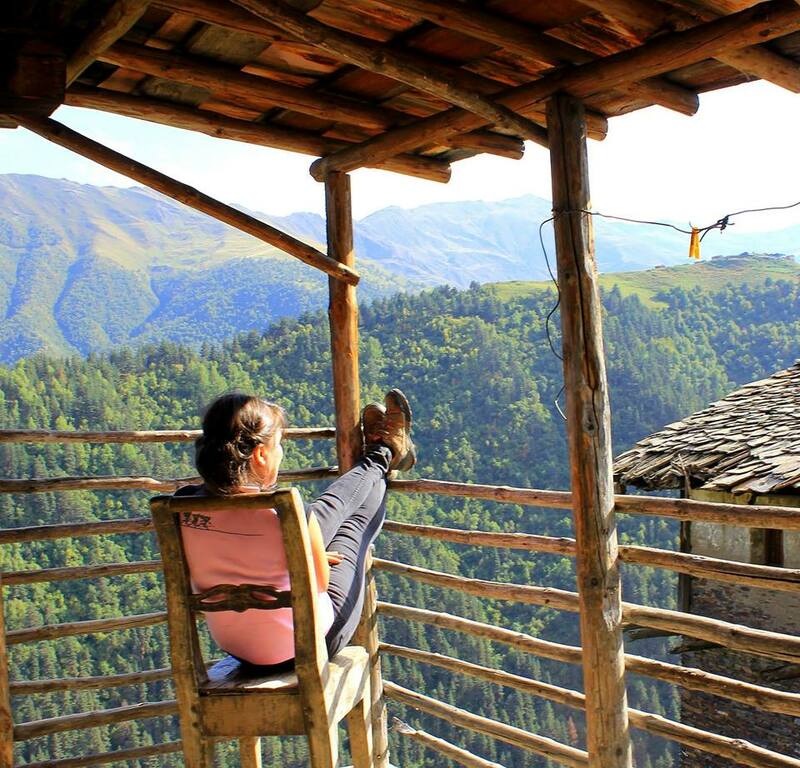 Tusheti is the region where you dont necessarily need to hike – its so panoramic that you feel yourself already on mountain top almost everywhere. Local cheese (guda), local beer, horse riding culture, pagan traditions, local feasts which last for few weeks with unfinished alcohol brought from Kakheti, most beautiful villages in Georgia, unbelievably unique and with middle ages feel, local shepherds who live 40+ years nomadic life taking care of sheep and move every May from the area near Vashlovani NP their sheep and bring back again in September/October across 3,000m elevation, where all the rivers flow north to neighboring Chechnya and Daghestan and all have one name – Alazani, where according to famous song, spring starts in June and and mountain goats always have snowed cliffs to stand on to greet each other, where life of Tushetian (Tush) man begins, where watching fogs flowing down from the ridges over crazy Alazani river, or attacking open fields and disappearing in endless spaces, one cant stop thinking about someone who he loves and wants to sing, tell poems and bring beautiful flowers from Tusheti mountains for her down to Alvani village. For info, Alvani village is in Kakheti at the edge of mountains, thats where Tushetians live off season and go back in summer to their paradise. 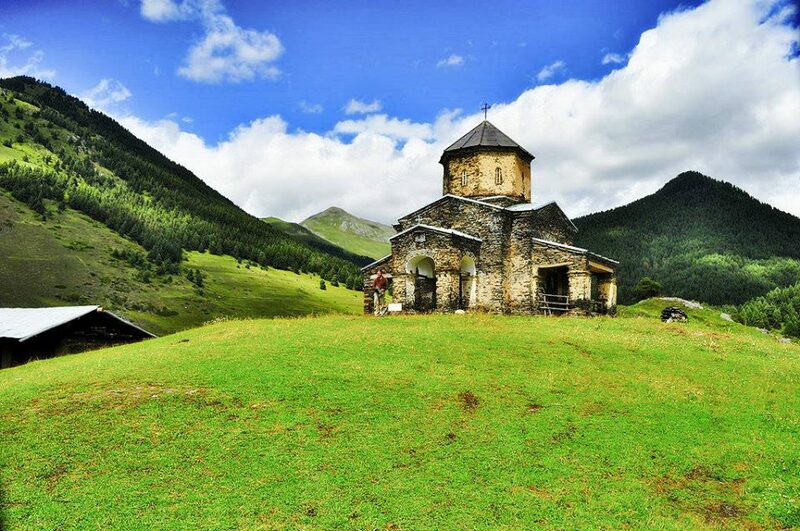 Tusheti is divided into 4 communities/gorges – Pirikita (most beautiful, must see villages of Georgia – Dartlo, Parsma, Kvavlo, Dano, Girevi), Gometsari (gorge with panoramic road, with Bochorna (Europe’s highest permanent settlement), beautiful Dochu, Tsovata is continuation of Gometsari, more mountinous and least touristic and less populated, thats where Tushs speaking Bats (Ingush-Chechen language group) language lived. 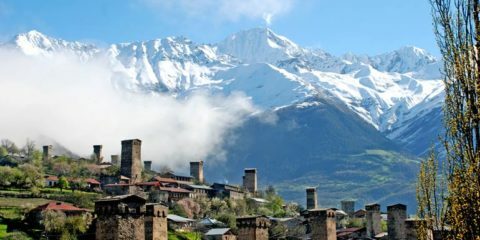 Also Chaghma community which is the main village and center of Tusheti – Omalo and quite different world in Tusheti Diklo and Shenako villages with beautiful Diklo fortress which has view over Daghestani villages. Jeeptour mostly has the base location of Omalo which has the best/most hotels/guesthouses, or 1 night in Omalo and 1 in Dartlo is also possible for jeeptour as Dartlo is very beautiful place to stay. For camping during jeeptour Mirgvela cottages and pine forest is central location to explore all gorges. Tsovata gorge is more for hikers. Therefore, jeep tour consists of Pirikita gorge is one must direction and needs 1 full day, another gorge to visit is Gometsari gorge – to 2-3 main villages you need half day and the last destination is Shenako and Diklo villages. 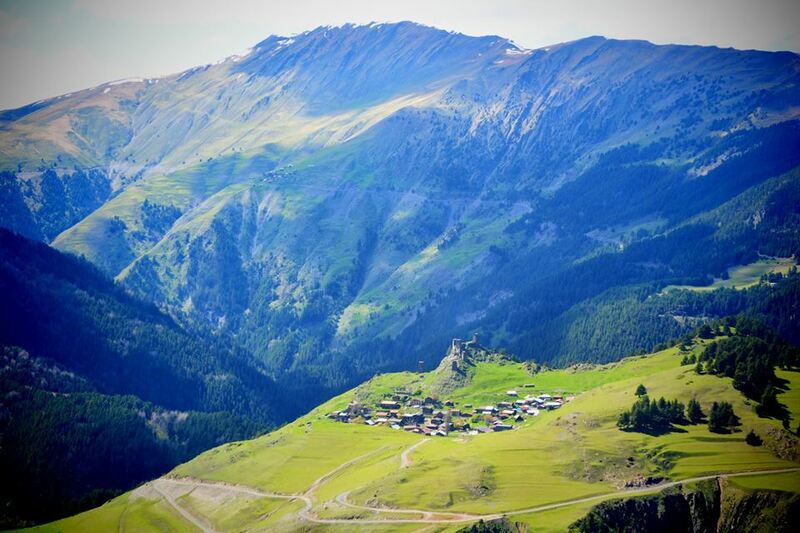 Therefore Tusheti jeeptour is possible to fit in 3 days, but 4 days is also fine. You can always include 1-2 short hikes or even longer Hike across Nakaicho pass between Parsma and Verkhovani. When driving to Tusheti you should start your trip early in the morning, the road takes some time and you need to have time to enjoy the evening in the wonderland. Drive through Gombori pass to Georgia’s wine region Kakheti, you will pass by one of the largest cathedrals of Georgia – Alaverdi. If you drive via Alvani you can ask your guide to show you a place where the horse of Tush hero – Zezva Gaprindauli died. Tushs before that had only mountain villages. 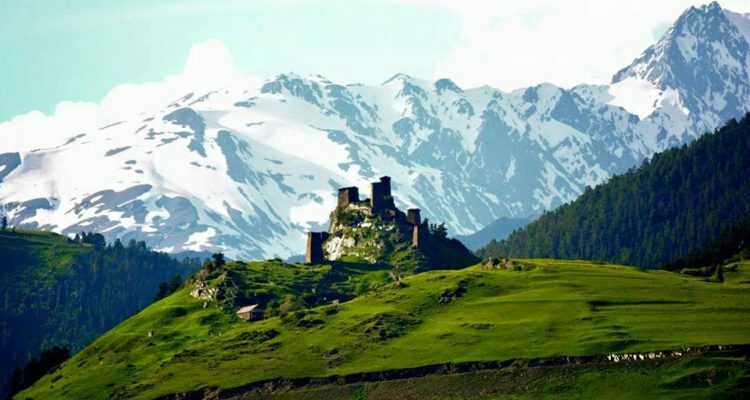 In 17th century after they helped Kakheti king to defeat Iranians at Bakhtrioni castle in Akhemta king decided to grant them some land in Kakheti lowlands and promised him – I will give you land from Bakhtrioni castle ruins till the point where you can race your horse to towards Tusheti. Horse managed straight 15km and died. After Alvani Tusheti road goes into forested river gorge, soon asphalted road ends and after some time you start craziest and most beautiful serpentins. You will not have to count turns as the beauty of road will amaze you at different levels you will go up mountain – you go up 2.5 km in vertical and this is not an easy job. There is Torghva’s abanoebi (Torghva Baths) before you reach the pass and take a selfie at 3,000m thanks to newly installed wifi antena at Abano pass. You will need to drink Chacha and bless the road at pass. 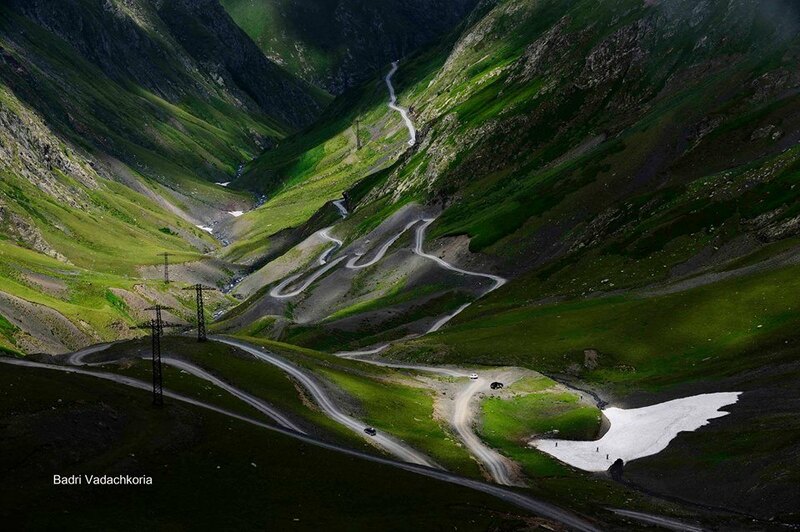 Generally Tusheti road is not that scary as it looks on pictures. Its not narrow and there are many drivers who travel there tens of times every year. But you can’t drive with your rented car in Tusheti, you need experienced guide for local roads which are incomparable. Besides 2930m Abano pass and road of multiple serpentins inside villages and gorges have its difficulties. Road to Gometsari gorge is another panoramic road which needs an attention, road to Dartlo crosses 1 pass and some stones may cut tires if you are not experienced and road to Shenako in case of rain and mud even locals avoid it. Since I have separate articles on some villages, I will give only highlights of jeeptour here. Lets start with Gometsari community, for jeeptour you must visit Dochu village. Its very panoramic village down the hill. Going down there you will find houses with balconies from where you can look down river gorge a few hundred meters below. You can also take a photo at Bochorna banner – Europe’s highest permanent settlement at 2345m. Narrow road at cliff is so beautiful, going down river gorge soon you can find scary narrow bridge for walking across river (kind of Devil’s bridge) where you can also take photo and test your courage. Another community is Chaghma – Omalo village’s prominent highlight which looks great on skyline is Keselo fortress. View from there can be especially beautiful in early summer or Autumn when nearby mountains are in colors or snowed. Then you can go forward towards summits. Beautiful Shenako village and nearby Diklo with fortress where you can walk to border guys and go down to fortress and enjoy views to 2 small Dagestani villages and different colored mountains. 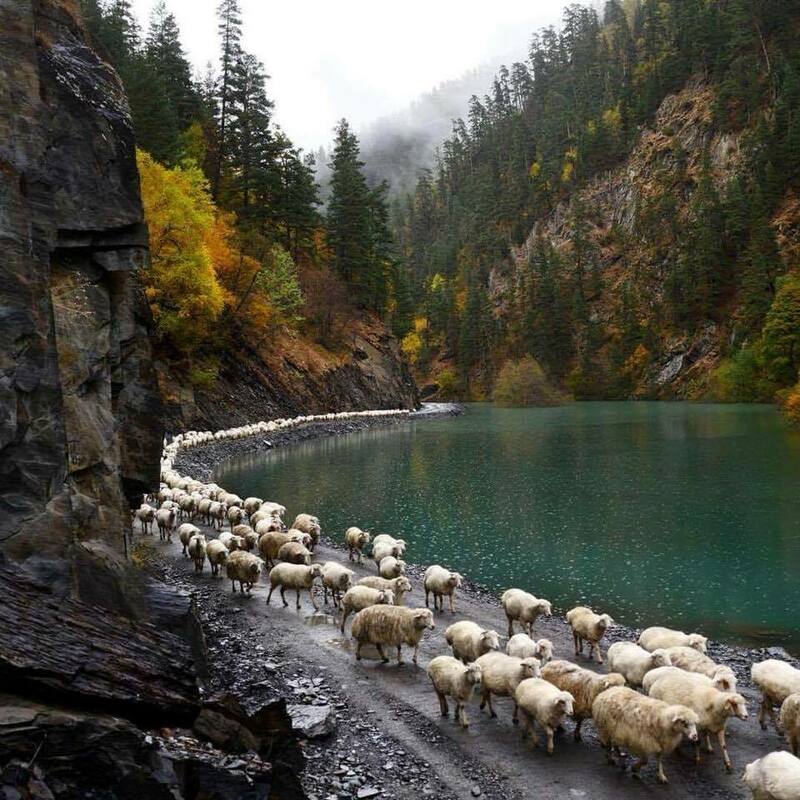 Those 2 gorges may take each half days in jeeptour while most time, at least 1 full days will be needed to visit main and the most beautiful community of Tusheti – Pirikita. After crossing another but smaller pass with tasty berries and pine forest you descend to village – Museum Dartlo. 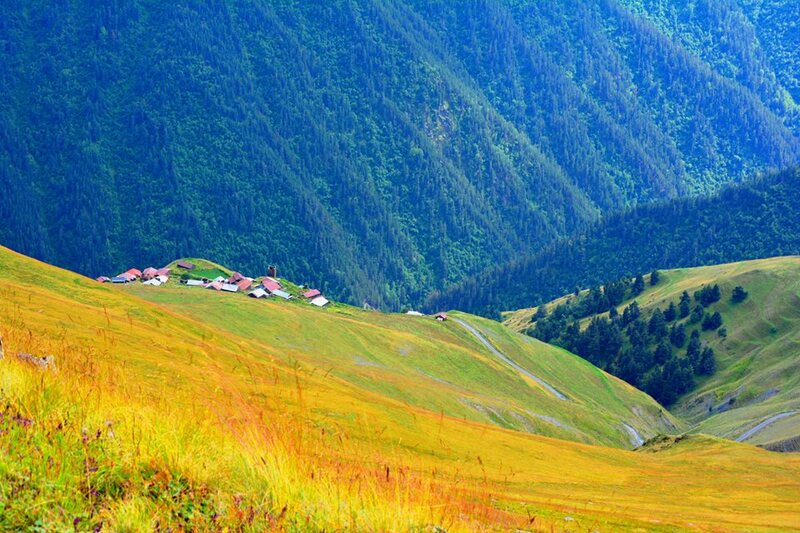 Its undoubtedly a main highlight of Tusheti so you cant miss it if you visit Tusheti. From there you must make it to sweet village of Parsma by car and then you can do some little hike to Hegho/Girevi near Chechnya’s border. Very impressive and must do short hike from Dartlo which all tourists visiting Tusheti cant miss is to walk up from Dartlo to the village Kvavlo above Dartlo and descend through Dano. If you are staying overnight in Dartlo the best is to do this in the first evening. In 3 day jeeptour you may manage to get to Chigho village as well where there was no car road till 2017. From there harder hike to Diklo begins. Its possible to add 1-2 days for dayhikes to standard 3 days jeep tour. 1 idea is Oreti lake. Its better by horses. Better to consider other dayhikes as well in August as water levels are low and the area don’t look green like in July or yellow like later in the second half of September. 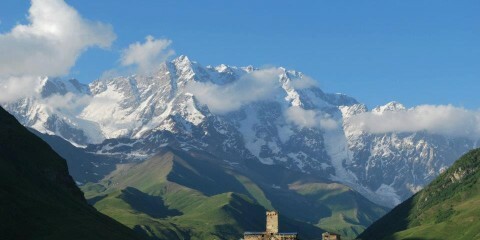 Another possible idea of dayhike is to cross the mountains between gorges. Like Nakaicho Pass hike from Parsma to Verkhovani village which is deeper in Gometsari gorge. Hike from Ghele to Parsma which means walking on the ridge can be a great dayhike idea as well. One more idea is to stay first night in Diklo at guesthouse and hike from Diklo to Dartlo preferably with guide and spend next full day in Dartlo and Pirikita community. On the way back the last day you can visit Dochu as well. 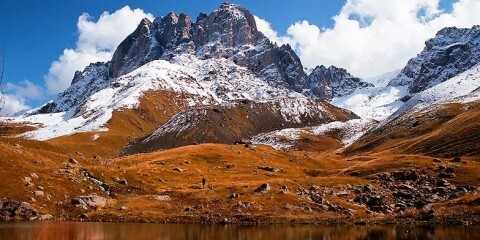 If you want just trekking and not jeeptour then you can read this article. Shopping and food: You will find some local souvenirs in Omalo and Diklo. 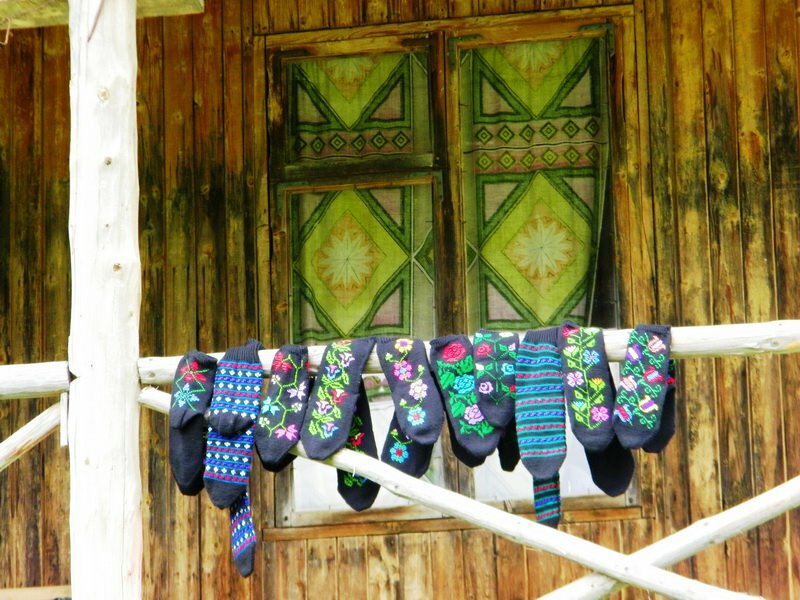 You will find fine produces of wool, textiles, warm socks and hats in Tushetian colors to buy.In Tusheti there are no ATMs or shops so you need to buy all you need in Tbilisi or Telavi. Also no pharmacy so please take suncreames, painkillers, medicines for stomach ache, for pressure, allergy you may be using. There are several cafes, 1 in Dartlo and possible to organize meals with locals even if you are camping. 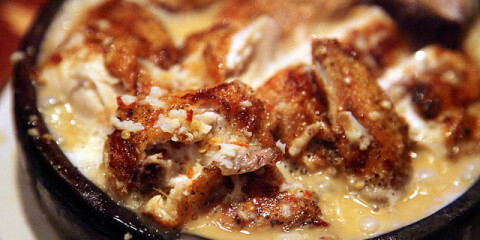 Food contains lots of dough and cheese so be prepared. You can try khinkali here but origin is from military road (Pasanauri). Kotori is thin khachapuri type local speciality. Regular Khachapuri you will get probably most nights as well as other food. Local beer may be served unfiltered and hot. Local guda cheese is something to buy, its stored in sack made from sheep’s or young cow’s skin with salt. Also Dambal Khacho is interesting to try, its dried cottage cheese balls. In addition, 1 good buy will be sheep – ask your guide to prepare chakapuli (better take some herbs from Telavi) and sheep shashlik. Try Khavitsi – made from cottage cheese not regular one you should eat hot right from the pan with Georgian bread. Pagan restrictions and traditons: Remember, beyond the pass (till Atsunta pass if you do trekking to Khevsureti) no pork is allowed. Its pagan tradition of locals which must be respected. One more pagan tradition restricts women (except for little kids and very old women) from approaching shrines (khati) but there are no signs for it, so when someone gives remark, please respect. Just to recognize its very small tower like construction from stones. What happens if you violate the laws: Its not obligatory to follow them but if you dont you may get fog and low visibility in hikes, get stomach ache after eating too much khachapuri, rain all days just because you brought some sausages with pork, someone may get in a car accident and locals may blame you that you angered shrines. So dont be source of negative energy which might come back to you, respect mythological laws. As for main Tushetian holiday, Atengenoba, its moving holiday – 100th day after Orthodox Easter and lasts 2 weeks. 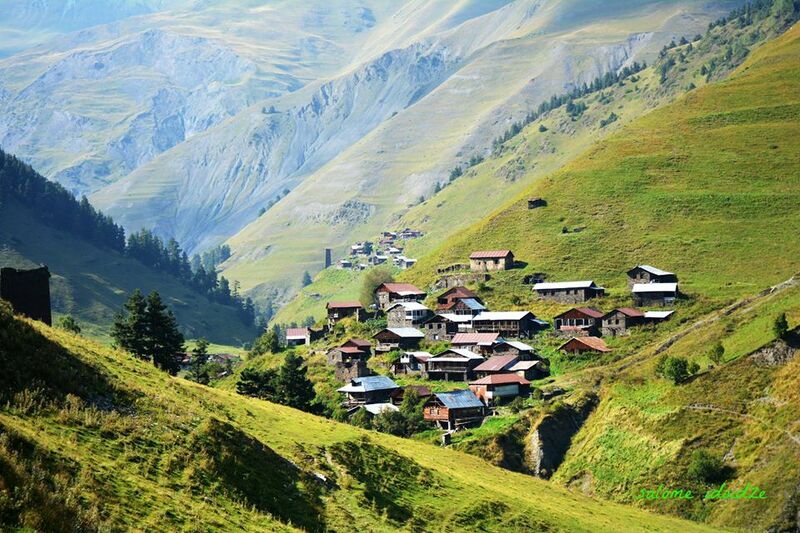 There are feasts in each village of Tusheti, according to their calendar, it may be interesting to see. You might try local beer – as Tushetians did not have vineyards they had beer culture. If its not holiday in some villages you may still find aludi (name for local beer)copper pots and if its Holiday then each village brews beer on its holiday. During holidays locals sacrifice sheep to shrine, they also might have some pagan rituals which may be interesting to watch and tourists are often invited. But just dont go primarily for it, as during holiday which lasts for 2 weeks usually its not fresh colors oof nature neither green nor yellow. 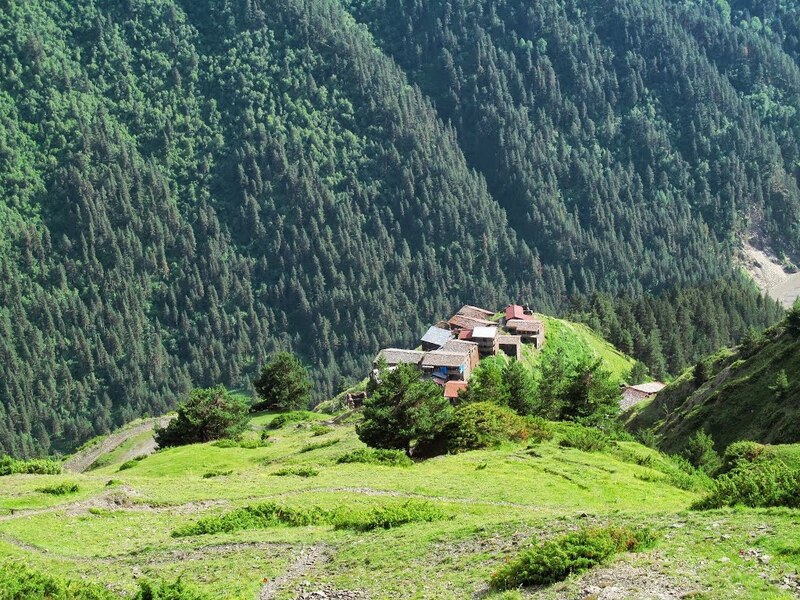 How to Get to Tusheti, when road to Tusheti opens and other practical info: Other than organized jeeptours from Tbilisi, you can get to Alvani by bus from the Ortachala station or shared taxis near metro Isani which also operates like buses. Bus will get you to Alvani in 1 hour 30 minutes or more. From Alvani you will be offered a jeep ride unless you have it pre-organized. In less then 4 hours you will be in Omalo. Jeep rate was 250 gel in 2017. There are guesthouses in many villages such as Omalo, Dartlo, Verkhovani, Jvarboseli, Diklo, Shenako etc but in early or later season some of the guesthouses may not function but there will be always someone in Dartlo and Omalo if the road is open. Road may open in the end of May, but there can be some earlier or later openings too. You can follow my fb page or ask in private for info. Also it will be great to come during annual festival Tushetoba and learn more about culture and participate in various events. You can also ask for private jeep, horse, bike or trekking tour planning.Generally 3-4 days for jeeptour and 4-5 days for inside Tusheti trekking tour is enough. Thank you for your detailed information. My wife and I are very interested in your 4 day Tusheti Jeep tour, and of course, the price. I am 63 years old, but have experience in camping and trekking with 25 kg backpack, and will prepare by walking around 2500 meters before trip. Hopefully my wife can join us trekking! Looking forward to seeing high peaks and villages. Our dates are July 13-16 or July 18-21. I am staying in Tbilisi for the month of April (leave April 26). I would love to do some light hiking, but the time of year/weather doesn’t seem to allow me to go to the most beautiful mountainous areas of Georgia. Can you make any recommendations for hiking in April?